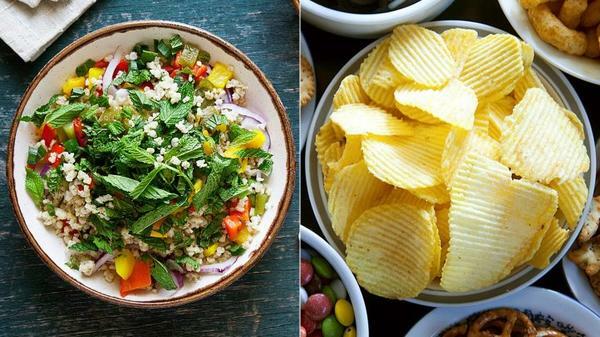 Best & Worst foods for People Trying to Lose Weight. Are you planning on losing weight? Well, if you are, then it is important that you are eating the best and the most nutritional foods to speed up the process. Losing weight has a direct connection with proper kind of snacks and food items. If you are not taking a note with your eating habits then your dream to lose weight will just be a mere dream. >Reducing the amount of fat. >Increasing the intake of foods, such as fruits and vegetables, which are naturally less calorie dense. Dark leafy greens -- broccoli, broccolini, spinach, kale, Swiss chard, rocket, dark green lettuce, watercress, etc. Non-starchy vegetables -- capsicum, artichoke, asparagus, beans and bean sprouts, beetroot, tomato, etc. Fruit -- berries, banana, avocado, apple, kiwi fruit, citrus, melons, etc. Whole grains -- brown, red and wild rice, millet, rolled oats, popcorn, etc. Legumes and beans -- chickpeas, lentils, kidney beans, butter beans, black beans, soybeans and tofu. Sweet treats -- sweet biscuits, cakes, desserts, pastries, ice cream, confectionery, chocolate, chocolate bars, etc. Sugary drinks -- soft drinks, diet soft drinks, sports drinks, fruit juice, etc. High calorie, greasy meals -- burgers, pies, pizza, kebabs, takeaway food and chips. Packaged snack foods -- sugary muesli bars, potato chips, corn chips, etc. Processed meats -- salami, bacon, sausages, chorizo, ham and hot dogs. So above are the few food items that can either help you or destroy your plan to lose weight. Things to Give Up if you are Trying to Lose Weight. Can Your Friends Help You In Losing Weight?